5. We demand of the legal government agencies, within the Constitutional Framework of jurisprudence and Check-n-Balance system of the current democracy style governing bodies, that a investigation on actual laws broken, on fraudulent behavior while being a government employee or government contractor, who generated or gave the correspondence to the public of falsified information, all be administered and all employees found guilty be immediately withdrawn from government employment as well as face charges within a Federal court system in regard to their illegal behavior! These are simple, and common sense solutions to the present conduct and criminal behavior of many employees within government agencies of today — whereas, these resolutions are only a beginning to resolve the worst of the worst government employees now being paid by tax payer money. “The BLM failed to analyze existing . . . conditions in the four allotments, Judge Winmill wrote, which he described as “particularly troubling” because the species is a candidate for listing under the Endangered Species Act. . . He also wrote that the four allotments are degraded by livestock grazing. . . Judge Winmill agreed that the BLM is allowed to automatically renew grazing permits without conducting lengthy environmental reviews. However, it must still comply with federal laws requiring the agency to consider ongoing rangeland degradation and observe the Fundamental of Rangeland Health regulations during allotment renewal.” Ibid. Once again the Bureau of Land Management employees, i.e. Rangeland Managers, decided to ignore Law, ignore appropriate decision making process based on good science, and pretty much went about their own decision making process of placing special interest first, despite the destruction their decision would cause on America’s Public Lands, and at taxpayer expense. Going to Federal Court costs the American taxpayers anywhere from $1.5 million dollars to upward of $12 to $18 million dollars in the past. . . Multiply this by the approximate 70 to 85 times yearly this government agency is taken to court, just within the parameter simply making bad decisions – and these figures escalate into an extremely large amount of taxpayer money spent questionably. But this is not unique at all to those of us who watch what the BLM does, and how they go about their irresponsible daily business. As the example above shows us, and many more are indeed available from the last year or two (even though we can reference up to 20 years ago quite readily), the wild horse herd roundups are unnecessary, where decisions made from false, and even politically manipulated information. When managed properly, through a horse herd’s natural ability to keep their breeding minimal, horse herds only grow 2% to a high of 4% (i.e. study groups as well as experience in observing horse herd interactions quite clear on this particular subject) – with predation decreasing herd size as well. This would cost taxpayers a few thousand yearly, not $billions as it is currently. Yes, this simple. Yes, they created a mess from their very beginning of wild horse herd management. They established a base-data platform that has been shown time and again to be erroneous at best. So they, in reality, created the mess . . . Then to attempt correction further down the decision making process tried to adjust it, which created more of a mess. Then they had to cover up their reasoning for making the adjustment which created an entire new mess; then to cover this mess up they created an entire system of lies – which today we call BLM Speak. But in truth, their mess simply piles-up profoundly over time, and now it is a huge garbage pile of a lot of messes, or corrective actions, and even corrective legislation transpired as well. This all, quite costly to taxpayers, in truth resolved nothing yet. Yes, taxpayer’s pay for this all – every bit of it, and not so surprisingly, no one knows how to stop the mass situation of lies, innuendo, and false information given to the public by this agency. So they, meaning Senators, Congressmen, along with BLM administers and management people, simply stand back and watch the mess grow in proportion with the destruction of America’s Public Lands and the abuse and killing of America’s Wild Horse Herds. Then they simply throw more and more money at their whim to whomever, and no one really questions what has been ongoing for decades – that is — Until these past few years . . .
Another easily obtainable fact – The Bureau of Land Management, along with its oversight government agency, the Department of the Interior, remain two agencies that are constantly in litigation, or have lost 98% of their litigation over the years due to bad decisions for one reason or another. Your tax money at work! The fact is taxpayer’s are paying for unnecessary Wild Horse Herd Roundups amounting now to $billions of dollars; we are also paying subsidies to Welfare Ranchers, who demand these unnecessary roundups as well, in the $billions of dollars unnecessarily, and in the meantime there is nothing given back to the taxpayer or American’s in general. As a matter of fact just the opposite occurs, and welfare ranchers feel entitled (i.e. yes, they Demand Taxpayer Money) for more taxpayer support and money — yes outright mooches all of them. This is what pays for their cattle, their cattle ranching efforts (most are non-competitive and operate their ranches at a loss – subsidies are their income – their yearly domestic sales receipts less than 1% overall) airplanes, new trucks, and that extra wing on their mansion out on what used to be a normal ranch house – and at taxpayer expense – and all the while disrespecting the taxpayer while demanding more $$$$. Right now the American Public and the American taxpayers need Representation. When it comes right down to it, our tax money is being spent for things we do not want it spent for! Taxation without Representation is ongoing before us right now, and on our Public Lands! Many Americans today view our government agencies with distain, most often rightly so. The laws that govern this land in the United States are being ignored by current government agency employees. And yet, they receive their payroll checks and salaries as if owed to them, in reality, for not obeying or even considering our nations legal requirements and regulatory methods of management. As any horse trainer, or animal trainer will tell you, this is not a good situation to do, as it delivers the wrong message. So we as taxpayer’s in America, repeatedly lied to by this government agency called the Bureau of Land Management – and always have been previously, remain a little bewildered and untrusting, and for legitimate reasons. For example, they tell us, taxpayers, everything is okay for them to go ahead and complete a Wild Horse Herd Roundup in accord with their Environmental Statements and Impact studies (a legal obligation in accord with legislative laws). In truth taxpayers pay for the studies, several hundred thousand dollars’ worth, but they are not done in accord with data gathering or good science – more often than not they are simply taken from another EIS from another region, changed to make it appear it was accomplished recently, and signed off as “No Environmental Impact in area will occur due to Roundups” which is a lie, that simple. The individual putting together the EIS never leaves his or her desk most often. We delivered more than a few Freedom of Information Act requests to BLM, in order to document the actual Field Studies of many Environmental Impact Statements they issued to the public – We received a standard response of “. . . no records of Field Study budgets or Expenses available. . .” Yet, there on a desk was an EIS that unequivocally stated different, or obviously the lie. Taxpayers foot the bill, for the falsified Environmental Impact Statement, often within excessive amounts, to include more often than not — $110,000+, for example. This being done a couple of hundred times, throughout the BLM offices and areas, and soon we see a vast amount of tax payer money spent very questionably just within this misrepresented arena of catastrophe for the Wild Horses. When we point this information out, so costly to all of us in America, we are called “extremists” or “malcontents.” No. in reality we are simply pointing out the facts, and oh what facts they are and on a constant basis. These government agencies, and Welfare Ranchers have been doing this for so long, they feel it is a normal crime to continue to commit. Yes, it is that easy. But take it from a previous BLM employee and Supervisor below . . . taken from a Federal Court Declaration. . . then multiply what he says by all other areas where Wild Horse Herd Roundups take place, and then we start getting the landscape of the astronomical scheme that is being perpetuated and promoted by this agency, the BLM, and Welfare Ranchers alike. . .
We continue further with Lloyd Eisenhaur’s Declaration and within another section of his statement, “. . . Considering that wild horses exhibit different foraging patterns and movement patterns than sheep and cattle, and also than big game such as antelope and elk, no sound biological basis exists for permanently removing wild horses from the Wyoming Checkerboard at this time. 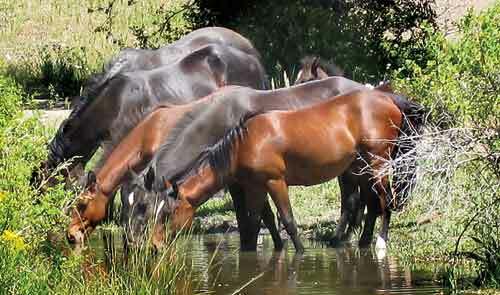 In particular, wild horses tend to hang out in the uplands at a greater distance from water sources until they come to briefly drink water every day or two, whereas livestock congregate near water sources and riparian habitat causing concentrated damage to vegetation and soil. For this reason, the impacts of wild horses are far less noticeable on the Checkerboard than impacts from livestock. “ Loyd Eisenhaur Legal Declaration . . . Ibid. . . The ideology of Welfare Ranchers, at this point in time, is not a complex issue. It is an issue of money, greed, and how to split the money among a small group of ranchers that hold Public Lands Grazing Permits. Their ally in this scheme, or crimes against the tax paying public, the Bureau of Land Management, remains at the disposal of these Welfare Ranchers and vast amounts of tax payer money. Over the years this situation has gone unnoticed by the public, under the radar for many decades now, from Public Scrutiny or thorough investigation. The Federal investigation (undercover work costing millions in taxpayer money) that took place in the early 1990’s was canceled right before Arrest Warrants issued (i.e. approximately 2,800 felony warrants). Many felony arrest warrants were about to be issued, then called off at the last moment – reasoning: To many employees in one government agency would have been taken to trial and would have overloaded the system, as well as place a burden on the Bureau of Land Management operations. . . No employees were fired, laid-off, or even so much as bothered by the investigation and arrest warrant situation. Ironic as well, these same Welfare Ranchers will chastise those who receive welfare checks to eat and nourish their children, calling them mooches; and yet, consider their subsidies received for nothing but using public lands to graze upon, as different and more of an “Entitlement” to them, which they demand they receive to this day. Yes, the tax free subsides are different, in a way and in their mind, but a style of socialism (which ironically the Welfare Ranchers also dislike the term socialism, very odd indeed since they are recipients of such a classification situation or social-mooches as they call it), and receive in the hundreds of thousands of dollars — each Welfare Rancher, and in total cost taxpayers $Billions of dollars yearly. And now the façade of ridding Americas Public Lands of Our true Heritage Icons, the Wild Horses, and under the guise of false information given to the Public and taxpayers of this land — and at a cost not only monetarily, but also with abuse and death of Wild Horses attached as well. Yes, they feel they are exempt from laws and ethics, and they are exquisitely “Entitled.” But as stated in many other articles, their beef is not so good, and domestic sales remain at less than 1% of actual sales receipts yearly. They ship quite a bit of meat product to Japan and China, so once again taxpayers get ripped-off. So we as taxpayers substantially finance, without approval from us I might add and on the sly, we basically fund these Welfare Rancher’s expenses to produce, feed, and ship the beef and sheep to foreign ports. All this in a very low-key and sneaky methodology, without the taxpayers knowing what is indeed going on. The problem that exists is they want to wipe out all Wild Horses on Public Lands, and replace them with cattle – which has already cost the American taxpayer $billions, under the cloak of agriculture as well as under the radar. But as mentioned above, and in oh so many science reports and data gathering events, it is not the Wild Horses doing reoccurring damage to Public Lands, it is the cattle and sheep – beyond a doubt. “. . . In addition, because livestock tend to eat somewhat different forage than wild horses (horses tend to eat coarser vegetation such as Canadian wild rye and other bunch grasses, whereas cattle and sheep mostly eat softer grasses), there is no justification to remove wild horses on the basis that insufficient forage exists to support the current population of wild horses. . . Also, because cattle and sheep have no front teeth on the front part of their upper jaws, they tend to pull and tear grasses or other forage out by the root causing some long-term damage to vegetation, whereas wild horses, which have front teeth on both their front upper and lower jaws, act more like a lawnmower and just clip the grass or forage (leaving the root uninjured), allowing the vegetation to quickly grow back. These differences are extremely significant because if there were a need to reduce the use of these BLM lands by animals to preserve these public lands, it might be cattle and sheep – not wild horses – that should be reduced to gain the most benefit for the lands, and which is why BLM, during my time as an agency official, focused on reducing livestock grazing.” Loyd Eisenhaur Legal Declaration . . . Ibid. . .
“. . . The zeroing out of wild horses in the Salt Wells and Divide Basin HMAs is also concerning because it would mean that, in those two longstanding HMAs, there would no longer be the “multiple use” of these public lands as required by both the Wild Horse Act and the Federal Land Policy and Management Act. Currently, while there are other uses of this public land, such as by wildlife, hunters, and recreational users, the two primary uses in those HMAs are by wild horses and livestock. If BLM proceeds with its agreement with RSGA to zero out wild horses in those HMAs, the only major use remaining would be livestock use, meaning that there would be no multiple use of those BLM lands. Not only will that potentially undermine the laws that BLM officials must implement here, but it has practical adverse effects on the resources – multiple use is very beneficial for the environment, and particularly for sensitive vegetation, because different users (e.g., livestock, wild horses) use the lands and vegetation in different ways. When that is eliminated, the resources are subjected to an unnatural use of the lands which can cause severe long-term damage to the vegetation. As a result, zeroing out these herds would likely be devastating for the vegetation in these two HMAs, because livestock would be by far the predominant use in this area.” Loyd Eisenhaur Legal Declaration . . . Ibid. . .
To say there is a problem here is an understatement. To say there is a scheme, a dynamic of illegal process and procedure is a statement well founded in facts, overwhelming facts that exist just not within this particular article, but within much of the BLM’s own paperwork and inventories, and just from reading the laws and management policies, and the contrasts that exists from a quick review of what BLM actually does in the field. The Welfare Ranching operations are nothing more than a financial nightmare, especially to taxpayers, and a scheme to receive money from the tax paying public – using antiquated and unuseful legislative Acts from the past – It is simply time to void and take them off the books, as no longer necessary or feasible in today’s time and place. Not only do most Welfare Ranchers receive large amounts of subsidies, to purchase more cattle and supplement their expenses, but derive almost a 92% to 99% income, tax free due to being a subsidy, going directly into their pockets. Do other American’s qualify for this? Nope — And for sure no one will, other than the small groups of those Welfare Rancher’s on Public Lands right now! This is not the American way of doing things, and our American Heritage; America’s Wild Horses are paying the price for this obvious ongoing criminality. Worse yet, nothing are being done to bring the BLM and other agencies, as well as Welfare Ranchers to task for such a corrupt situation that exists on our Public Lands today. Our American Heritage, the Wild Horse Herds, pay the price of criminal indulgence. The above quotes taken from Court documents, LEGAL DECLARATION filed by former BLM Rock Springs and Rawlins area manager, Lloyd Eisenhauer: IN THE UNITED STATES DISTRICT COURTFOR THE DISTRICT OF WYOMING Rock Springs Grazing Association, Case No. 2:11-cv-00263-NDF Plaintiff, v. Ken Salazar, et al.,Defendants, DECLARATION OF LLOYD EISENHAUER. — Pursuant to 28 U.S.C. § 1746, I declare under penalty of perjury that the foregoing is true and correct. — Lloyd Eisenhauer. Wild Horse Heard Advocates watched in horror as Bureau of Land Management (BLM) Contractors, and BLM employees, kill a pregnant Mustang. It was quite obvious she was with foal, and worse, ready to give birth. “We will not forget Jewel, the wild pregnant mare the BLM killed. She was run down with their helicopters. Then without remorse or even the slightest whim of sanity, or empathy, they shot her. This is where your tax dollars go, killing our wild horses. 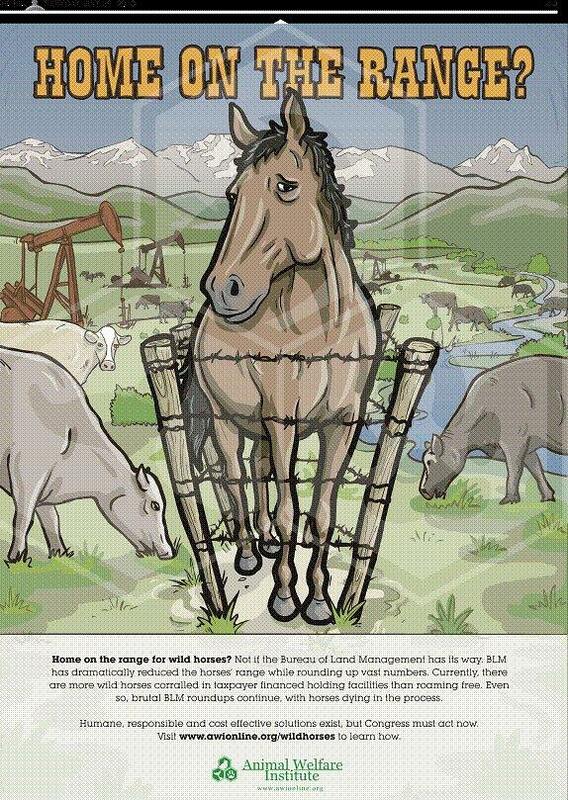 This so cattle can graze on OUR PUBLIC LAND free or at low cost,” stated a Wild Horse Advocate. The Facts: these unscrupulous individuals’ with no ethical means of approach to Wild Horse Herd Management, chase down with helicopter an innocent and pregnant Mustang Mare. Yes, they run her down. They threatened her at every step. The slanted blades of their helicopter tipped forward in the chase — nothing more or less than unrelentless psychopathy. She finally collapsed. She uncontrollably gasped for enough air for both her and her foal. Suddenly, the BLM employees on the ground committed their assault. They approached, insanity at its most profound, then shot the Mustang Mare — They shot her in the head; a foal in her belly. A once would be new born, left to die within its mothers womb. Left in the mud — both left to rot. How sad. The BLM employees laughed while pointing at the dead horse, then turned and left. This is our American Heritage, the Wild Horses, and the way this government agency treats them. Horses, right along our side in war and work, helped build America. They worked and helped expand and build the wild west. How can this situation, done by this government agency, even take place? How is this even allowed? Humanity at its worst yet. And worse, supported by your tax money. The Reality — attention toward Wild Horse Herd Dynamics while in the wilds, a far better and less costly management paradigm and methodology, a few thousand yearly compared to the present reality of spending billions — ignored in total by this government agency. American’s lose — The Wild Horse Herds, and the burden of far more tax money spent on unnecessary and incompetent Public Lands Management. Yes, tax money taken from school lunch programs, from feeding people in America, from Veteran’s who fought our wars and were wounded, and much more — taken and spent on situations like killing Jewel, the mare with foal — yes, killing the innocent for the greedy.